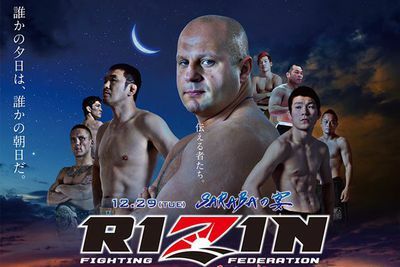 Rizin has a long way to go if it plans on topping those old PRIDE posters (like this one). We still don’t know who Fedor Emelianenko will be fighting at the end of the month, but whatever, here’s a snazzy little event poster featuring “The Last Emperor” that should hold you over until Rizin Fighting Federation gets around to releasing that little nugget. As you can see from the photo above, Rizin will hold two separate events, one of which includes an eight-man heavyweight tournament (details). Emelianenko will compete on the Dec. 31 card, which like the Dec. 29 mixed martial arts (MMA) event, takes place inside Saitama Super Arena in Saitama, Japan. Much has been made about the former PRIDE champ’s return and while he’s been attached to a handful of fighters since un-retiring from combat sports, nothing is official at this time. That announcement is expected in the next few days (we hope) but in the meantime, you can catch up on all the other Rizin event news right here.